Discover downtown Pest’s landmarks on a Segway tour, with the help of a professional guide! Meeting Point: Opera House on Andrássy Avenue (M1 Underground, Yellow Line). Address: Andrássy út 22. Budapest 1061, 15 -20 minutes before the tour starts. See the centre of the Pest side on a 1-hour fun Segway tour with professional guiding. Small group tour – max. 12 persons – with plenty of stops for photos and questions. The two-wheeled self-balancing scooters are an exciting and quick way to explore the many sights of Budapest. Tour departs in all weather, rain or shine. The tour begins with a 15 – 20 minute training and orientation (added to the 1 hour tour duration) in English by a professional tour operator. After you’ve learnt to navigate the Segway and feel comfortable riding on it, the 1 hour tour begins. Dates: every day between 09.00 – 18.00 all year round, Note: The last tour on 20. August, a National Holiday in Hungary – departs at 12.00. Stops for photos and questions. 1. Opera House – The Hungarian State Opera House stands on Andrássy út. 2. Andrássy Avenue, a Parisian-like boulevard packed with cafes and shops. The neo-Renaissance building was built at the end of the 19th century based on the designs of Miklós Ybl architect. 3. St. Stephen’s Basilica – the city1s largets temples stands in the heart of Pest. The plaza in front of it gives home to a popular Christmas Market each year. 4. Parliament – the vast building and one of the tallest in Budapest on Kossuth Square was nicely refurbished in previous years. 5. A view point stop at the Danube bank with perfect view of the Royal Palace in Buda. 6. Szabadság Square – the tour ends on Liberty Square, a park surrounded by stately buildings (the U. S. Embassy and various monuments. The controversial WW II Holocaust monument also stands here. Please note that we reserve the right to modify or change the tour program without prior notice throughout the year. any events beyond our control. Please note that the city prohibits the use of Segways in certain pedestrian zones which may force the tour to use alternative routes. 1. Tour departs in all weather conditions, rain or shine. Please dress appropriately. Bring hats and gloves in colder months, sunhats, sunglasses in summer months. 2. If something comes up and you can’t do the tour please notify us at least 72 hours before. No refund is paid if you don’t show up and doesn’t inform us about it within 72 hours. 3. Riders must have the ability to make motions such as climbing and descending stairs without assistance. 4. Riders must weigh at least 90 lbs/40 kg and be at least 10 years of age. Parents/guardians must sign liability and waiver forms for any participants under the age of 18 years. Infants, toddlers are not allowed on the tour. 5. 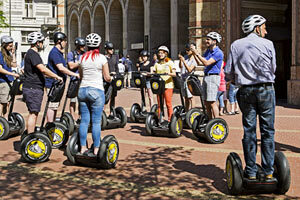 The Segway is not appropriate for people weighing over 280 lbs/130kg or under 90 lbs/40kg. 6. Anyone suspected of being under the influence of alcohol will not be permitted to ride and forfeit their right to do the tour, without refund. 7. Pregnancy: the Segway tour is not recommended for those expecting a baby. State of pregnancy might affect your sense of balance and thus riding a Segway is not safe when pregnant. 8. Insurance Waiver and Damage Deposit: tour participants must fill in and sign a liability waiver. Children under 18 years must have an adult sign for them. For Children – Can Kids Do the Tour? Children older then 10 years can do the tour – if they weigh minium 40 kg/90 lbs. They can ride without parent/adult accompanying them but under the age of 18 a parent or legal guardian must sign the insurance waiver prior the tour.